Some of the organisers of the association’s first congress—Niall Delargy (UCG), Cecil Smith (QUB), F. X. Martin (UCD), Laird Taylor (TCD) and Con O’Leary (UCC). 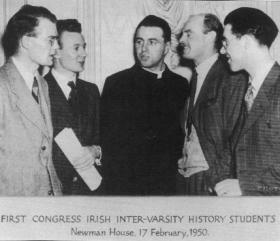 This year’s conference of the Irish History Students’ Association marks the 60th anniversary of the inaugural congress of the Irish Inter-Varsity History Students (as the association was then known), which took place at Newman House on 17 February 1950. Robert Dudley Edwards, Professor of Modern Irish History at UCD, was very much the moving spirit and served as senior archivist, mentor and adviser to successive committees down to 1980, when he retired from the post. As the co-founder with T. W. Moody of Irish Historical Studies and the Irish Committee for Historical Sciences, which encompassed representatives from North and South, Edwards was equally determined that the new student association would have a strong North–South basis. This has been the bedrock of the IHSA, with the notable contribution of Queen’s University, Belfast, where Professor David Hayton has been a staunch supporter of the IHSA and regularly drives the Queen’s contingent in a minibus to the annual conference. In his obituary of Dudley Edwards in Irish Historical Studies in 1988, Aidan Clarke, another IHSA alumnus, wrote that Edwards ‘performed for undergraduates that integrative function that the Ulster and Irish Historical Societies performed for their teachers, and which provided for Edwards himself the recurrent stage for which many of his more fabulous exploits were set’. This year’s conference will inaugurate the Robert Dudley Edwards Prize for the best undergraduate paper. From the beginning the association has provided a social as well as a historical forum for the members. An annual conference hosted by one or more of the member societies has been held since 1950, and the conference proceedings have been published. The 1962 conference, which was held at Magee College in Derry, was a landmark since it was the first occasion on which delegates from England, Scotland and Wales attended (there is no equivalent student history association in Britain). In the late 1960s and early 1970s the number of member societies increased dramatically, with representatives from the University of Ulster; Mary Immaculate College, Limerick; St Patrick’s College, Drumcondra; Carysfort College, Blackrock; St Joseph’s and St Mary’s Colleges of Education, Belfast; and the University of Limerick. Old conference programmes read like a roll-call of distinguished Irish historians, past and present. In 1975 F. S. L. Lyons was the guest speaker and generously gave his paper to the IHSA journal, Retrospect, for publication. At the 2004 conference in Galway, Nicholas Canny and Gearóid Ó Tuathaigh recalled their IHSA adventures in a memorable and hilarious opening address. Over the past twenty years the IHSA has reflected the changes taking place in Irish third-level education. It was largely an undergraduate organisation but that has changed with the growth of postgraduate studies. Graduate students now dominate the annual conference, which is an important event where they can present their research, so important that it now attracts students from Britain and elsewhere. The undergraduate profile has diminished, however, and we are hoping to rejuvenate this with the Dudley Edwards Prize. This year, apart from that prize, two others are being offered at the conference. The Military Heritage of Ireland Trust is offering a prize for the best paper on Irish military heritage, in the widest sense of that term. It embraces the worldwide nature of Irish military heritage, not merely a record of individual or group activity, nor of the success or failure of military leadership in battles, campaigns and wars. It also includes service in peace support operations, the maintenance of law and order in aid to the civil power and the impact of such activities on the economic, political or social life of the communities of the participants. The Irish Economic and Social History Society is also offering a prize for the best paper on a topic in economic history. Publication of the conference proceedings has been dormant, mainly because of cost, but preparations for a peer-reviewed e-journal are now in train and it should be ready within the next year. On a personal note, I was involved in the IHSA in the early 1970s and made lifelong friendships. Over 60 years the association has played an invaluable role in giving students an opportunity to develop their interest in history and allied disciplines in an enjoyable atmosphere, and in promoting closer relationships between students from universities and colleges throughout Ireland and Britain. Deirdre McMahon is Lecturer in History at Mary Immaculate College, Limerick, and Senior Treasurer of the IHSA.